Gliding in a stable kayak on the pristine waters of the Cudgegong River is a stunning and relaxing way to experience the wonders of the breathtaking Wollemi National Park. 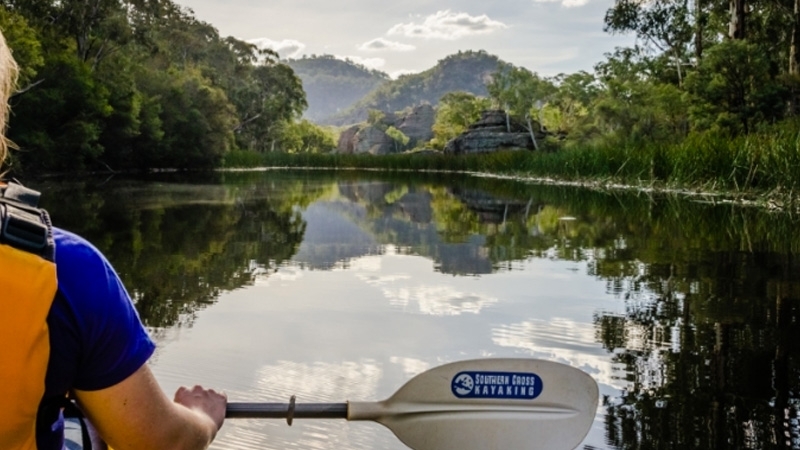 Southern Cross Kayaking offer guided tours through the spectacular World Heritage listed Wollemi landscape, providing a unique paddling experience and informative commentary on the fascinating natural and cultural history of the area and it's environmental significance. From the long history of habitation of the Wiradjuri people, to the first European settlement, the notorious 'lady bushranger' and the incredible tale of the building of the weir that formed the waterway as it exists today, there are stories of interest for everyone. Cost: $50 per person + $1 booking fee per ticket. Cost Includes: Use of quality double sea kayaks, paddles and safety gear, Safety briefing, Paddling instruction and map, Use of dry bag for your camera. What to bring: Shoes that can get wet, Sun protection (hat &/or sunscreen), Drinking water, Sense of fun and adventure . Additional Details: Suitable for children 12 years and older and paddlers of all skill levels, boats are stable, ‘sit-in’ kayaks. Meeting Place: Meet at the picnic area beside the boat ramp. Daily during school holidays and on weekends from 29th September 2018 to 28th April 2019. - Distance from Rylstone is 25kms and takes approximately 25 minutes. The last 8km is a gravel road suitable for 2 wheel drive vehicles, but is narrow and winding in places, so please drive with care. Weather: Tour will depart as scheduled except in extreme weather conditions of high wind or electrical storms. Southern Cross Kayaking will advise of any changes due to weather conditions at least 2 hours prior to the scheduled start time of your tour, or contact them on 0439 936 480 if in doubt. No experience is necessary; all tours and hire include safety equipment, safety briefing, paddle instruction, a map and information on the area. The calm, protected environment means that conditions on the water are suitable for novice as well as experienced paddlers of both kayaks and stand up paddle boards.